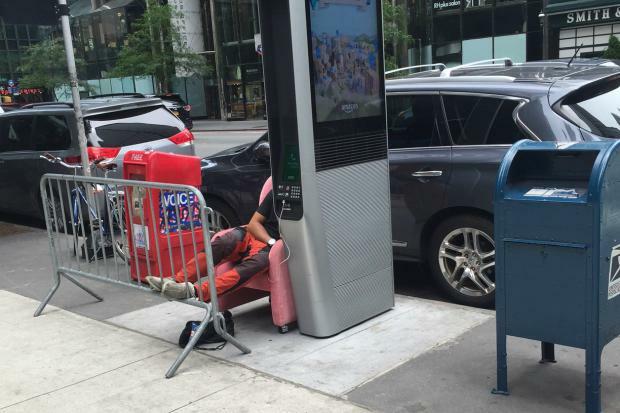 Valerie Mason saw a man sleeping in a plush recliner, plugged into a LinkNYC kiosk at East 49th Street and Third Avenue, on July 4. UPPER EAST SIDE — The city's LinkNYC kiosks are taking over the neighborhood, residents say, crowding sidewalks with as many as four to one block and drawing users who've been seen camping out on the street to plug into them. The city installed at least 40 new Link NYC kiosks on the Upper East Side beginning in March, and residents say they've created a nuisance in the neighborhood due to the size and density of the machines. While the kiosks, which stand 9-feet 6-inches tall, have so far only been installed in spots where public pay phones used to be, more are coming, with the city's goal to bring 4,550 of the machines to the city by July 2019, according to CityBridge, which operates LinkNYC. "These are extremely intrusive and extremely large," said resident Betty Cooper Wallerstein. "If they were alone, I might not have an objection to the size, but they're not alone. There are all kinds of structures along the street." The kiosks — which offer free access to Wi-Fi, phones, phone chargers and internet browsers — have also become spots for drug deals, according to some residents. The NYPD did not respond to requests for more information. Valerie Mason, the president of the East 72nd Street Neighborhood Association, said she saw drug deals happen in front of two ;kiosks in her neighborhood on the Fourth of July. The dealers were makings phone calls and handing over plastic baggies, she said. "Why are we going back to the 1970s? That really wasn't a great period in New York City," Mason said during a Community Board 8 meeting on July 6. "Why would you want somebody to have unlimited access like that to create a crime scene in the middle of Manhattan?" Mason also noted seeing a man sleeping in a plush recliner while plugged into a kiosk at East 49th Street and Third Avenue on July 4. Similar encampments were documented in photos posted on social media, including one in front of a kiosk on 35th Street and Third Avenue. During the July 6 CB8 meeting, members and residents said they are concerned for the safety of the neighborhood and the city should have come to them for their input before installing the machines. “The process has been subverted here by [Department of Information Technology & Telecommunications] and LinkedNYC,” said committee member Barry Schneider. “We are advisory...except if we are not asked, we cannot advise." A spokeswoman for LinkNYC said that it was not the company's intention to have people take advantage of the kiosks and said some measures have already been taken, like lowering the volume allowed at night, to curb some noise complaints they have received. On the east side, the kiosks have so far been installed along Third Avenue from East 59th to East 96th streets, and up north as far as East Harlem and The Bronx and as far south as the Lower East Side. Some blocks have a higher concentration of the machines than others though, residents said, including at 68th and 69th streets, 76th and 77th streets, and through the 80s — with as many as four kiosks on one block. The city only requires the kiosks be located at least 50 feet from each other, according to a City Hall spokeswoman. "The ideal would be 260 or 300 feet between them so you don't have to put more than one tower at each block," said Lo van der Valk, president of Carnegie Hill Neighbors. "There should have been an attempt to make the proliferation less." The kiosks were also installed on the west side along Eighth Avenue and parts of Broadway from West 13th to West 145th streets. The LinkNYC spokeswoman said that the size of the machines is as small as the company could make them to fit the necessary technology inside and that the Public Design Commission worked with the Department of Information Technology & Telecommunications on locations. But had the city come to the community first before setting plans in place, the crowding could have been avoided, according to van der Valk. "The public review process is backwards and forwards," he said during the board meeting last week. "Here, now we have a chance to talk about it because people on this board raised issue with it." Community board members said they would work with LinkNYC and the city to set up a meeting about current and planned kiosk locations on the Upper East Side. The city plans to install 4,550 kiosks across the city by July 2019, according to the city’s agreement with CityBridge. Additionally, at least 7,500 kiosks will be installed by July 2023. Below is a map of locations where phone booths exist(ed), and where LinkNYC kiosks will be installed.